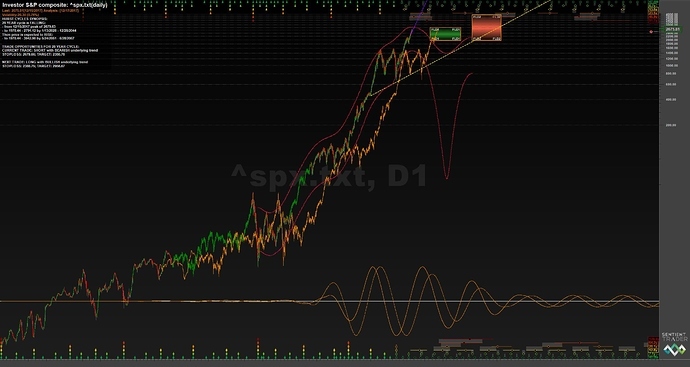 David’s webinar Monday on long term cycles was timely as I have been working on a number of the same issues using different spectral analysis techniques. Sentient Trader is great for short term trading but I needed additional tools that allowed for analysis of long data sets and systematic backtesting if possible (more on this later). One advanced spectral approach that is excellent for looking at financial data is empirical mode decomposition (specifically ensemble EMD). EMD can handle non-stationary, nonlinear financial data better than any other spectral analysis method because it is entirely empirically-based (no functional form assumption of sine waves like FFT) and it uses local fitting to decompose a time series into its primary frequencies (intrinsic mode functions or IMFs). I won’t get into the weeds too much here because there has been a lot written on EMD over the last few years. One word of caution, EMD does an excellent job identifying cycles in-sample but is basically worthless for backtesting and trading out-of-sample because of serious repainting issues (also know as the end-point effect). My partner and I analyzed the DJIA monthly since 1790 and used EMD to decompose the price time series into the following cycles. Not bad, from a Hurst perspective. We then created composites by combining multiple IMFs (frequencies). The results are shown below. Visually, this approach not only smooths the data but adds some structure and context to the raw price chart. When I first look at a chart I always start with the eyeball test. What struck me in the above analysis was the fractal similarities between the 1835-1860 and 1929-1950 time frames. I then overlaid the 18 year and 42 month IMFs on the price chart from 1850 to present (Bloomberg does not allow dates prior to 1850) to see if this would help me phase these long cycles. This is shown below. What is interesting is the near perfect phasing the 18 yr IMF produces from 1861 to 1932. After 1932, the measurement of the 18 yr cycle breaks down. Given how EMD measures cycle periods, the average cycle length over the entire time period is not significantly impacted by the 18 yr cycle disappearing for an extended period. (I added what I think is the correct 18 yr cycle length of 212 months at the bottom of the chart). To use William’s words, the 9 and 18 year cycles lack “cohesiveness”, which creates a challenge when doing this type of long term analysis. However, the 42 month cycle keeps time like a Swiss watch. In fact, when these two cycles are in sync from 1861 to 1932, there are exactly five turns of the 42 month cycle for every one of the 18 year cycle. William has also stated a number of times that Hurst made simplifying assumptions regarding cycle synchronicity. This analysis proves it’s close but not perfect. Many of you who have traded are likely nodding your head in agreement. You are probably thinking “So what? I care about the right edge of the chart and not all the way back into the 1800’s”. I actually think this type of analysis can be helpful if carried forward to the current day. Because you have very good harmonics and agreement between these two cycles earlier in the data set, you can use this to phase the early periods and simply count five turns of the 42 month cycle to phase the more recent 18 year lows. This approach, and the fact I used more data than David, produces a slightly different analysis than what he came up with in his webinar. For example, our EMD analysis shows the lows in 1932 and 2003 are both 18 year lows. BTW, these results are consistent with the long term phasings in both Profit Magic and Christopher Grafton’s book. The real punch line to all this is the next chart. It pieces together five 18 yr (212 month) cycles into a monster 88.37 year cycle (1060 months). 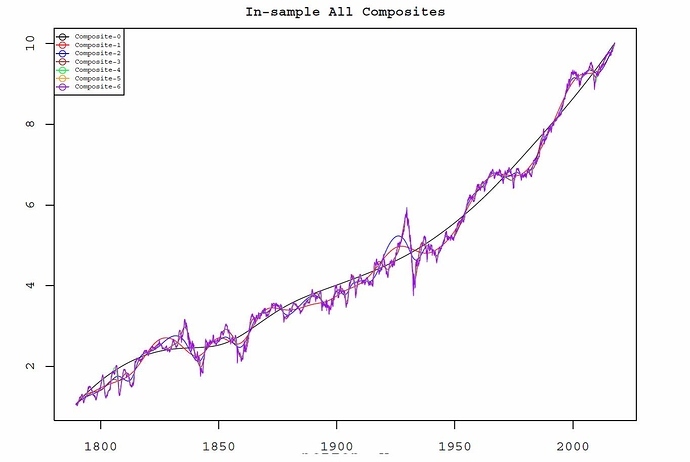 Since there isn’t enough data to prove it with spectrum (227 years of data gives only 2.5 turns of the 88 year cycle), you have to look at this chart and ask yourself, “Can the 88 year cycle be dominant?” Before answering, I suggest you drag a 1060 month cycle ellipse around the chart and see for yourself. My answer is yes, with several caveats. I do not expect a 90% drop in stock prices and a repeat of the Great Depression over the next three years. However, I could envision a very severe drop in stocks over this time period. In addition, shorter cycles, which are not considered in this analysis, could also have a significant impact on the direction and magnitude of upcoming price moves. The good news is we won’t have to wait long to find out. We are exactly 1060 months from the August, 1929 high. Gulp. Even if you don’t believe any of this, we are approaching an 18 year high as David mentioned in the webinar. The last 18 year high produced a 50% drop in the S&P over a comparable time frame (2000-2003). No need to stock up on beef jerky quite yet, but it probably pays to be a little cautious over the next several months. 1921 depression (also known as the drive-by depression). 1921+88 years=2009. Gleissberg cycle. It’s real and it’s been around a very long time. Stanley Druckenmiller and the Kitchin cycle. Hi ya Curt I like what you have on this. One question “My partner and I analyzed the DJIA monthly since 1796” where is that early 1800’s data coming from? I am more familiar with the Dow going back to 1896.
https://measuringworth.com/DJA/ I used this site in the past for some interesting perspectives have you been on it before? I would like to point out that EMD is good for finding dominant waves not cycles. Lang used to call it bisector method it is similar to EMD method but manual. I will post an example later. So I am not convinced that 89 year dominant wave is a cycle but in fact a compilation of cycles. The is problem and it comes up when we try to prove or disprove that wave exists (luck of data). Inability to test assumption based on EMD can be overcome by building a model based on the EMD results using past data only. Coherent aggregates harmonically united constitute centers of vibration bearing relation to the fundamental pitch not multiples of the harmonic pitch, and the production of secondary unions between themselves generate pitches that are discords, either in their unisons, or overtones with the original pitch; from harmony is generated discord, the inevitable cause of perpetual transformation." During last ST webinar David has presented 7(atomole) model. My tests show that it seems to be better than 8 (atomole) model at list during last 20 years. 7(atomole) model coresponds well with PK Wall model. I got it from a contact on the street. Prior to 1896 it’s “stock prices” (not the Dow). It’s good data. The Cowles Commission was the source for the early years. Should be the same as the Foundation for the Study of Cycles website but I haven’t checked it. Exactly. This is another future (ambitious) project. What will be tricky is quantifying how these long waves (88 yr, K-wave, 18 yr, etc.) will impact price. The interactions are complex and dynamic (resonance?). You can lock onto one wave and it can change, although the longer waves will change more slowly. The best answer I’ve heard is that the dominance in the longer waves will manifest itself in the shorter waves, so focus there. I assume everyone knows there is nothing in my post that will help them trade. Thank you will look that those …Are you doing an longer term outlook of what may happen with things at well beyond historic levels? This person did a mesa scan which found similar results to Hurst on the longer cycles. He breaks down 2 periods 1921-1965, and 1990 to 2015. FYI, changing the end point effect assumption in the R EEMD program we are using from null to wave creates another IMF with a length of 530 months. 530x2=1060😊. My personal preference is not to segment data into shorter periods (and use a shorter nominal model), at least for stocks. The magic in this stuff comes from more, not less data. The 1990-2015 period only has one turn of the 18 yr cycle. That tells me nothing when trying to confirm or develop a nominal model. I do like what the author did in verifying Hurst’s work, although that was hardly necessary. The more time I spend on this stuff, the more I realize that investors’ behavioral responses to events, and therefore markets, have not really changed much over time (although I will admit volatility is higher around these events now). Chapter 6 cycletec gives Hurst own phasing of DJIA monthly may be worth a read to see how it correlates with your own longer cycles. For me I have been working on using larger cycles 18 yr, 9 yr etc to see how the principle of variation plays out over historic dips over broader view. Model averaging, or at least tracking several, makes a lot of sense. My data science guy has shown me how this produces the best risk-adjusted returns (I used to just care about returns). Using delayed model in my view is the must. it gives early warning that model is no longer effective so only my pride suffers not my account! Fascinating how human behaviour does not seem to alter over many many years. I guess evolutionary changes only happen on a timescale far too long and far too subtle to notice in our own puny lifespan. Perhaps this post will crop up in hundreds of years and someone will cite your work! Until machine learning, neural nets, AI, and robots take over the markets (and world), human behavior and sentiment should continue to produce recurring price patterns. Actually, it is possible to build a machine learning or neural net trading strategy that trades complex wave interactions if you have enough data. A workaround for lack of data is using shorter time frames. I believe some on this forum, including Gary, have already done something similar (although they may not call it this). I will post a paper on an example of this approach in the currency markets later. Perhaps they have already Curt and we are living in a simulation - the cyclic rhythms being an artefact or clue of such a system. I really should start a thread on this kind of esoteric thinking! This paper is just a summary of the results. The full dissertation is online with the detailed trade-by-trade backtest results. I’ll admit, this isn’t exactly world-class research but the results are encouraging. I think the intra-day timeframe minimizes the end point (repainting) issue, plus they have made some curve smoothing adjustments that help. I have an ST analysis for you back to May 1st, 1789, with the 42 month nominal model. Apparently ST was not anticipating going this far back, as it does not put numbers on the horizontal time axis. The 28y is currently coming out as dominant, with peak and through running roughly in phase, and the 1877 trough is actually preceded by deeper throughs in the synthetic data. The system puts the 112 year cycles of peak and trough analysis roughly in antiphase to (partially) cancel each other. For 7 years (atomole) hypothesis to hold, DJIA needs to have significant pull buck starting first quarter of 2018. 2018 correlates well with a variant of Benner Cycle. One is tempted to think the diagram is a modern hoax, but link below points to an 1897 magazine article that reprints the diagram.